Home Heritage Group Inc. (“HHG”) is a North Carolina-based designer and manufacturer of home furnishings; it sells product via (i) retail stores, (ii) interior design partners, (iii) multi-line/independent retailers, and (iv) mass merchant stores.” In addition, the company has an international wholesale business. Why do we mention Chapter 22? For the uninitiated, Chapter 22 in bankruptcy doesn’t actually exist. It is a somewhat snarky term to describe companies that have round-tripped back into chapter 11 after a previous stint in bankruptcy court. That, to some degree, is the case here. WAAAAAAAY back in November 2013, KPS Capital Partners LP formed the newly bankrupt HHG entity to acquire a brand portfolio and related assets out of the bankruptcy estate of Furniture Brands International Inc. (“FBI”). FBI had been, in the early 2000s, a very successful purveyor of various furniture brands — to the tune of $2b in annual sales. 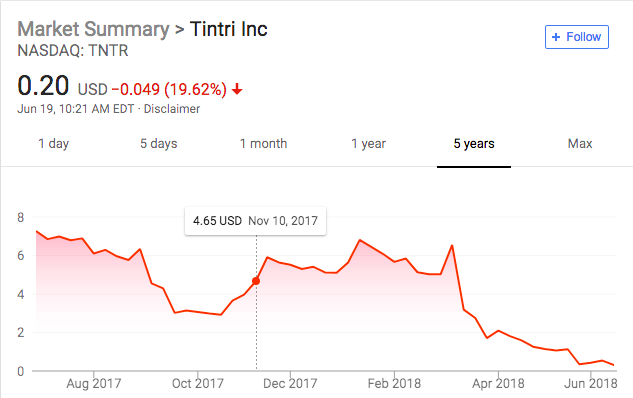 But in the 12 months prior to the acquisition, the company’s sales were down to $940mm and, more importantly, its EBITDA was negative $58mm. At the time of filing, it had $142mm in total funded debt outstanding, $200mm in unfunded pension obligations and another $100mm in general trade obligations. As a manufacturer and retail of home furnishings, Furniture Brands’ operations and performance depend significantly on economic conditions, particularly in the United States, and their impact on levels of existing home sales, new home construction, and consumer discretionary spending. Economic conditions deteriorated significantly in the United States and worldwide in recent years as part of a global financial crisis. Although the general economy has begun to recover, sales of residential furniture remain depressed due to wavering consumer confidence and several, ongoing global economic factors that have negatively impacted consumers’ discretionary spending. These ongoing factors include lower home values, prolonged foreclosure activity throughout the country, a weak market for home sales, continued high levels of unemployment, and reduced access to consumer credit. These conditions have resulted in a decline in Furniture Brands’ sales, earnings and liquidity. Sales have continued to be depressed as a result of a sluggish recovery in the U.S. economy, continuing high unemployment, depressed housing prices, tight consumer lending practices, the reluctance of some households to use available credit for big ticket purchases including furniture, and continuing volatility in the retail market. …some of the Company’s larger brands have lost some of their market share primarily due to competition from suppliers who are able to produce similar products at lower costs. The residential furniture industry is highly competitive and fragmented. Furniture Brands competes with many other manufacturers and retailers, some of which offer widely advertised, well-known, branded products, and other competitors are large retail furniture dealers who offer their own store-branded products. All of these factors stormed together to constrain the company’s liquidity and force a chapter 11 filing and eventual sale. KPS purchased several of the FBI brands for $280mm (subject to working capital adjustments), including Thomasville, Broyhill, Lane, Drexel Heritage, Henredon, Pearson, Hickory Chair, Lane Venture, and Maitland-Smith. In other words: brands that your grandfather would know and you would shrug at the mere mention of. Well, some of you anyway. Following years of sales declines, many furniture retailers had lost faith in the ability of the Company to produce, deliver, and service its products, and the bankruptcy led many of them to shift their purchases to a variety of competitors or even further utilize their own private label offerings. In addition, the Company’s operations and performance depend significantly on economic conditions, particularly in the United States, and their impact on levels of existing home sales, new home construction, and consumer discretionary spending. Although economic conditions have been steadily improving in recent years, the Debtors have struggled to adjust to certain shifts in consumer lifestyles, which include: (i) lower home-ownership levels and more people renting; (ii) more apartment living and single-person households; (iii) older consumers that want to age in place; and (iv) cash-strapped millennials that are slow in forming households relative to prior generations. Consumer browsing and buying practices are rapidly shifting as well toward greater use of social media, internet- and app-based catalogs and e-commerce platforms, and the Company has been unable to develop a substantial sales base for its brands through this key growth channel. PETITION Note: My, how things have remained the same. Sound familiar? Have to hand it to the professionals here: why reinvent the wheel when you can just crib from the prior filing? We guess being a repeat customer in bankruptcy has its benefits!! Chapter 22!!! E-commerce furniture sales have emerged as a major growth area, rising 18% in 2015, second only to grocery, according to research from Barclays. …home brands now have an outsized onus to produce best-in-class product pages for the influx of online shoppers. However, many brands have failed to deliver and aren’t keeping pace with industry disruptors. Sounds like HHG has, admittedly, fallen into this category. GartnerL2 highlights the disparate user experiences offered by Williams-Sonoma-owned West Elm and Chicago-based DTC disruptor Interior Define, which was founded in 2013 and has raised $27mm in funding (most recently a Series B in March). The latter offers extensive imagery, a visual guide and an augmented reality mobile app. All of these things appeal to the more-tech-savvy (non-cash-strapped??) millennial buyer. All of these factors resulted in continual YOY declines in sales and a liquidity squeeze. Now, therefore, the company is in bankruptcy to effectuate a sale — or sales — of its brands to prospective bidders. It has one purchaser in line for the “Luxury Group” and, according to the court filing, appears close to an agreement with a stalking horse buyer of the Broyhill and Thomasville & Co. properties. In the meantime, the company has a commitment from prepetition lender PNC Bank NA for a $98mm DIP, of which $25mm Judge Gross granted on an interim basis. Long time PETITION readers know that our general theme is “disruption, from the vantage point of the disrupted.” Disruption can come in various forms. In many cases it comes from technological innovation. The dreaded “Amazon Effect” that everyone is so tired of hearing about falls into this category. But as we’ve said time and time again, mobile e-commerce is a big part of that story and that would never have been made possible — and perhaps brick-and-mortar would still be intact — if it weren’t for the Apple Iphone ($AAPL), for Shopify ($SHOP), and for Instagram ($FB), among many other disrupters. Today’s innovations are leading indicators for tomorrow’s bankruptcies. Disruption — and, no, we don’t always use this term in the Clayton Christensen sense — can come in other forms. There can be regulatory and/or legislative disruption, political disruption, environmental disruption, etc. In the case of PG&E — short for Pacific Gas and Electric Company — it may be all of the above. To continue reading, you must be a Member. You may become one here. Tough is one word for it. There are countless players in the home security and monitoring space including (i) recently-IPO’d ADT Inc. (owned by Apollo Asset Management),* (ii) Vivint Inc., (iii) Guardian Protection Services, (iv) Vector Security Inc., (v) Comcast Corporation, and (vi) SimpliSafe Inc. And there is also the identity-confused schizophrenic Monitronics International Inc., formerly known as MONI Smart Security and now known as Brinks Home Security, which is a wholly-owned subsidiary of publicly-traded holding company Ascent Capital Group ($ASCMA)(did you get all of that?). Nearly all of these companies compete in the market for “alarm monitoring agreements” (AMAs) — contracts pursuant to which these companies provide home monitoring services in exchange for predictable recurring revenue. Predictable in a manner of speaking: with this much competition, the industry is getting a wee bit…less…predictable…? Competition in the security alarm industry is based primarily on reputation for quality of service, market visibility, services offered, price and the ability to identify and obtain customer accounts. Competition for customers has also increased in recent years with the emergence of DIY home security providers and other technology companies expanding into the security alarm industry. We believe we compete effectively with other national, regional and local alarm monitoring companies, including cable and telecommunications companies, due to our reputation for reliable monitoring, customer and technical services, the quality of our services, and our relatively lower cost structure. We believe the dynamics of the security alarm industry favor larger alarm monitoring companies, such as MONI, with a nationwide focus that have greater resources and benefit from economies of scale in technology, advertising and other expenditures. (emphasis added). Make no mistake: ASCMA is purposefully highlighting its monitoring expertise, size and scale. And that is because the market for AMAs is getting increasingly challenged by a number of home security providers. And many of them are of the do-it-yourself (“DIY”) variety. For instance, home owners can get home security devices from Arlo by Netgear. ** Or Canary. Or Honeywell ($HON). Or Google (Nest)($GOOG). Amazon Inc. ($AMZN) recently bought Ring Doorbell for $1 billion and that, too, has a home security system. Gadget stores are replete with options for DIY home security systems. Do people even need professional installation and/or monitoring anymore? With property crimes on a nationwide decline, is a self-monitoring system viable enough? Why bother when you can just get alerts to the phone in your pocket or the watch on your wrist? These are the big questions. As of December 31, 2017, MONI was one of the largest alarm monitoring companies in the U.S. when measured by the total number of subscribers under contract. MONI faces competition from other alarm monitoring companies, including companies that have more capital and that may offer higher prices and more favorable terms to dealers for alarm monitoring contracts or charge lower prices to customers for monitoring services. MONI also faces competition from a significant number of small regional competitors that concentrate their capital and other resources in targeting local markets and forming new marketing channels that may displace the existing alarm system dealer channels for acquiring alarm monitoring contracts. Further, MONI is facing increasing competition from telecommunications, cable and technology companies who are expanding into alarm monitoring services and bundling their existing offerings with monitored security services. The existing access to and relationship with subscribers that these companies have could give them a substantial advantage over MONI, especially if they are able to offer subscribers a lower price by bundling these services. 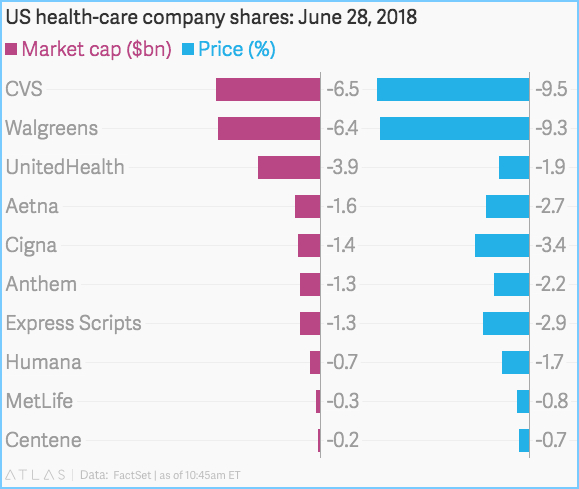 Any of these forms of competition could reduce the acquisition opportunities available to MONI, thus slowing its rate of growth, or requiring it to increase the price paid for subscriber accounts, thus reducing its return on investment and negatively impacting its revenues and results of operations. And here we thought people were shunning the cable companies? Here is Wirecutter reviewing “The Best Home Security System.” And suffice it to say, the Monitronics’ product is not the winner. In fact, Wirecutter knocks the “Brinks Home Complete with Video” system on cost. Here is PCmag reviewing “The Best Smart Home Security Systems of 2018” and the LiveWatch Plug & Protect IQ 2.0 is buried down the list with a 3.5 star rating (out of 5). The maturity date for both the term loan and the revolving credit facility under the Credit Facility are subject to a springing maturity 181 days prior to the scheduled maturity date of the Senior Notes. Accordingly, if MONI is unable to refinance the Senior Notes by October 3, 2019, both the term loan and the revolving credit facility would become due and payable. The downgrade of Monitronics' CFR and facility ratings reflects strains on the company's liquidity and capital structure caused by impending maturities, as well as its continued lackluster operating performance. The liquidity rating downgrade to SGL-4 reflects the approaching debt maturities. Moody's views Monitronics' liquidity as operationally adequate, but weak in terms of imminent, likely accelerating debt maturities. As a result of the company's continued lackluster performance, Moody's expects Monitronics to generate barely breakeven free cash flow this year. The (unrated) $295 million, super-priority revolving credit facility is large and has, as of early July 2018, a time of seasonally heavy revolver borrowing, roughly $80 million drawn. Reliance on the revolver also creates liquidity risk because the revolver expiration will spring to October 2019 if the notes are not refinanced. While cash on hand continues to be modest ($30 million at March 31st), Monitronics' parent company, Ascent Capital Group, Inc.("Ascent"), has nearly $110 million of cash, which may be viewed as providing additional implied support. Still, Monitronics' combined sources of liquidity are weak relative to the quantum of debt coming due in the next few years. Reliance on the revolver for operational initiatives and to fund purchases of new subscriber contracts from dealers will also prevent meaningful deleveraging over the next year. Weak operational metrics also continue to shrink the cushion it has relative to covenant limits, and the risk of a covenant violation over the next 12-15 months is elevated. Ergo, the capital structure is rumored to be advisored up with (a) Houlihan Lokey and Stroock & Stroock & Lavan working with an ad hoc group of unsecured holders and (b) Jones Day and Evercore working with the term lenders. Latham & Watkins LLP reportedly represents the company. Anchorage Capital may be a bit of a wild card here as they allegedly hold a meaningful position in the term loan and the unsecured bonds. This company is looking a bit insecure. Hard to blame Apollo for getting out while the gettin’ is good. ** As we were researching and writing this piece, Arlo Technologies filed its S-1 for a planned $194mm IPO. The firm posted $6.6 million in income on $370.7 million in revenue for 2017. Ascent Capital Group, ADT Inc., Apollo Global Management LLC, Vivint Inc., Guardian Protection Services, Vector Security Inc., Comcast Corporation, SimpliSafe Inc., Monitronics International Inc., Honeywell, Google, Amazon, Arlo Technologies Inc.
Is anything available in New York City for less than $5? Some of you are about to find out. Retail rents are tumbling in Manhattan, especially in the toniest neighborhoods. In the area around the Plaza Hotel on Fifth Avenue, home to the borough’s priciest retail real estate, rents fell 13.5 percent in the second quarter from the previous three months, the largest decline among the 16 neighborhoods tracked by brokerage CBRE Group Inc. The drop was due in part to a single space that had its price cut from $3,500 a square foot to $2,500, CBRE said in a report Tuesday. Tenants have the upper hand in New York as landlords contend with a record number of empty storefronts. Across Manhattan, 143 retail slots have sat vacant for the past year, and rents have been reduced on more than half of those spaces, CBRE said. Property owners are increasingly willing to negotiate flexible terms in an effort to get tenants to commit to leases, according to the report. Some brokers expressed disappointment with the tenant selection. “It’s not a Fifth Avenue-type tenant. Everyone is pissed,” one broker said of the deal because of the nature of the tenant on a prized part of Fifth Avenue. He added: “There goes the neighborhood.” A more suitable location, the broker said, would have been south of 42nd Street. “Not sure this was the tenant surrounding landlords with available space were hoping for,” said Jeffrey Roseman, a vice chairman at Newmark Knight Frank Retail, who was not involved in the deal. Wait. What? Currently, there’s literally a JPMorgan Chase Bank, a Walgreens and a Kaffe 1668 right there there. Who among that lot can rightfully object? Our thoughts exactly. Those adhering to a New York City of yesteryear clearly haven’t noticed the influx of coffee shops, pharmacies and banks on every corner. Who else would take such a large space? Toys R Us? Unfortunately for those in the space, those themes persist. On Monday, Luby’s Inc. ($LUB) — the owner and operator of 160 restaurants (86 Luby’s Cafeteria, 67 Fuddruckers and 7 Cheeseburger in Paradise) reported Q3 earnings and they were totally on trend. 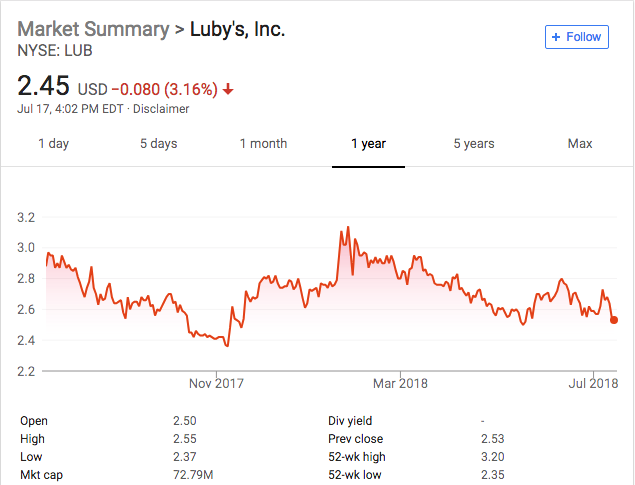 While the company reported positive same-store sales at Luby’s Cafeteria — its largest brand — the company’s financial results nevertheless cratered on account of increased costs (in food, labor and operating expense) without a corresponding acceleration in sales (via either increased prices or guest traffic). The company’s overall same store sales decreased 0.9%, its total sales decreased 3.1%. “…the current competitive restaurant environment is making it difficult for our brand and the mature brands of many others to gain significant traction. We've been faced with the environment for quite some time, which has been a large drag on our financial results and our company valuation. Like many other chains, therefore, Luby’s is rationalizing its store count. The company previously committed to shedding at least 14 of its owned locations to the tune of an estimated $25mm in proceeds; it is accelerating its efforts in an attempt to generate an additional $20mm in proceeds. The use of proceeds is to pay down the company’s $44.2mm of debt. The company also announced that it hired Cowen ($COWN) to assist it with a potential restructuring of its Wells Fargo-agented ($WFC) credit facility. That hire was a requirement to a July 12-dated financial covenant default waiver (expiration August 10) provided by the company’s lenders. The lenders’ move to organize comes as Steak ‘n Shake has shifted its focus from company-owned locations to franchise opportunities in the face of declining revenue, same-store sales and customer traffic as well as increased costs. A wholly owned subsidiary of Biglari Holdings, Steak ‘n Shake is a casual restaurant chain primarily located primarily in the Midwest and South United States; the chain is known for its steak burgers and milkshakes. Biglari says that unlike company-operated locations, franchises have “continued to progress profitably.” “Franchising is a business that not only produces cash instead of consuming it, but concomitantly reduces operating risk,” the 2017 chairman’s letter says. Even so, 415 of the total 616 Steak ‘n Shake locations are company-operated and creditors are pushing the company to bring in operational advisors, sources say. The company’s $220 million term loan due in 2019, which according to the Biglari 10-Q had $185.3 million outstanding as of March 31, has dipped to the 86/88 context, according to a trading desk. The term loan, which matures March 19, 2021, is secured by first-priority security interests in substantially all the assets of Steak ‘n Shake, although is not guaranteed by Biglari Holdings. Same-store sales fell 0.4% in 2016 and another 1.8% in 2017. Traffic last year fell 4.4%. Curious. Apparently the company’s reliance on higher traffic to generate profits didn’t come to fruition. Insert lawsuit here. Insert lender agitation here. Insert questionable business model shift here. We do not just sell burgers and shakes; we also sell an experience. Given all of the above and the perfect storm that has clouded the casual dining space (i.e., too many restaurants, the rise of food delivery and meal kit services, the popularity of prepared foods at grocers), lender activity at this early stage seems prudent. Steak N Shake, Luby's Inc., WeWork, Bertucci's Holdings Inc.
Total auto loan debt increased to $1.23 trillion in Q1 2018, up from $1.17 trillion versus a year ago, and accounted for 9.3% of the $13.21 trillion in national household debt – remaining greater than credit card debt, but less than student loan and mortgage debt, according to Federal Reserve Bank of New York data.